The first full-length record in over six years and the first to be recorded and produced as a complete band, it was a joy to get such a vibrant new offering from Jimmy LaValle and The Album Leaf. Lifts the spirits right from the soaring opener (“False Dawn”) and keeps them aloft with sophisticated rhythms and intricate sound design that remains easy on the ear. Definitely recommend the track-rich deluxe edition which adds four new songs and five remixes. Following the simple pattern declared in the album title, the flowing guitar compositions by Black Hill (Csarnogurszky István) are profoundly melodic as they meander and shimmer like a rippling waterway while the earthy piano interpretations of the same songs by heklAa (Sébastien Touraton) showcase a variety of styles from romantic modern classical to passionate post rock with elements of jazz & blues thrown in the mix. It is a beautiful musical conversation and a delightful listening experience. Sprawling post rock narratives with the peregrine spirit of the wide-eyed traveler and efflorescent melodic structures that periodically erupt into thunderous crescendos and rise like snow-capped mountains. Even at full roar, Coastlands sound transcendent rather than harsh and they are more than capable of the patience and subtlety to create a spellbinding mood or evoke a landscape as evident in the closing track which references the haunting beauty of the Neskowin Ghost Forest on Oregon’s coastline. 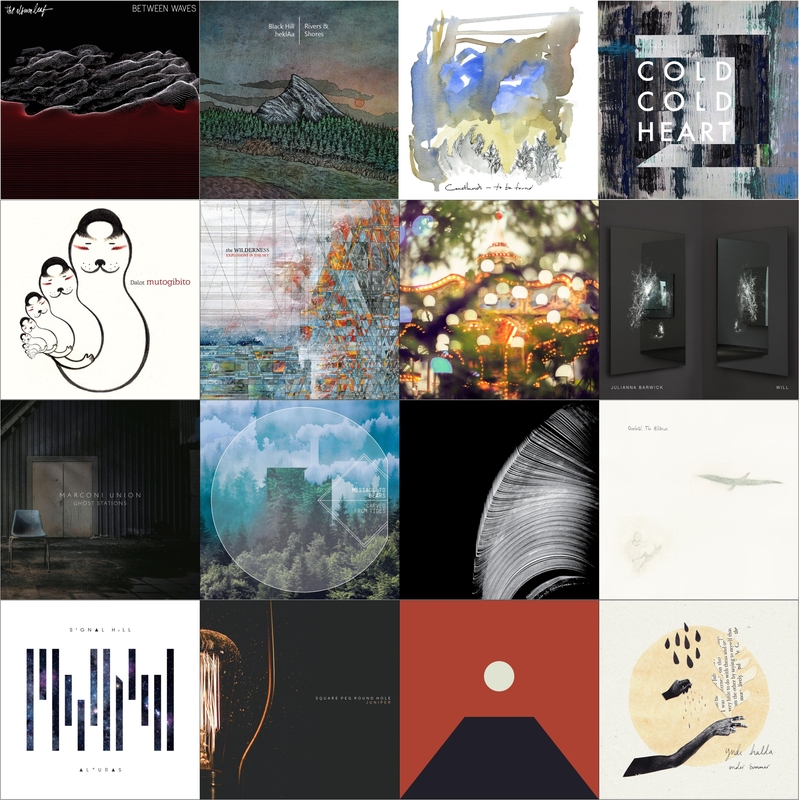 In these seven affecting tracks we can hear the soaring e-bow arcs and tender arpeggios of Explosions in the Sky, the brooding melodicism of Mogwai, and the lyrical piano/violin narratives of Rachel’s to name a few. When these are employed at the same time and in perfect balance, as they are on the penultimate track ‘Mountain’, it is strikingly beautiful. While Ancestors (2013), looked almost solely backward through a melancholic ambient/modern classical lens, mutogibito is a much brighter, even playful, album that is multi-referential on a number of levels and finds Dalot embracing a variety musical influences and experiences with a vibrant forward-looking optimism as she playfully layers retro tones and syncopated beats with lush ambient textures and soaring guitar-driven melodies full of light & color. The liner notes state that “if The Earth Is Not A Cold Dead Place was the defining album of Explosions In The Sky‘s career, The Wilderness is the band’s [re]defining album” and that is a pretty fair assessment. A bold and highly inventive record from a band that clearly has no intention of repeating themselves. That said, they did bookend the album with a lovely pair of tracks that will feel like touching home base for fans of their earlier work. Hammock’s first album since the existentially heavy Oblivion Hymns marks a glorious return to their expansive, shoegazy guitar-driven sound hearkening back to the band’s 2006 breakout album Raising Your Voice… Trying to Stop an Echo which also saw a deluxe reissue this year. Everything and Nothing is a big-hearted, soul-searching, sumptuous record with the same astonishing level of musical craftsmanship and deep emotional investment that Marc and Andrew seem to pour into every one of their projects and this one is a beauty. Julianna Barwick‘s ethereal looped and layered vocals are the very definition of beguiling and on this, her third full-length album she adds rich synth-laden undercurrents and new elements to play off of such as the voice of Mas Ysa’s Thomas Arsenault and cellist Maarten Vos. Breathtakingly beautiful and completely captivating. What do you do for an encore after recording “the most relaxing track in the world“? If you are Marconi Union you certainly don’t rest on your laurels. Ghost Stations, incorporates many elements from their earlier work that have won over and endeared them to so many listeners, but it stretches out in some enticing new directions as well. A moody and intoxicating milieu especially suited to nocturnal listening. It seems clear that Jerome Alexander threw everything he had musically and emotionally into Carved From Tides, but it feels anything but haphazard. Ambient textures, intricate rhythmic elements, synth-driven pop, intimate strings, cinematic orchestration, and tender acoustic ballads are all part of the heady mix and they all are blended together organically and seamlessly. Very easy on the ears from the first listen, but the sophisticated underpinnings make this one more satisfying with every rotation. Apparently as far back as the period after the lush electronica of his 2006 debut Go Out and See was released, Tim Arndt intended to create a beatless ambient follow-up, but that idea did not come to fruition until this album, his sixth release on the label. Helical maintains an intimate feel throughout with the piano providing the compositional framework while Arndt exercises discretion and restraint in his layering of the electronics so they never distract from the impetus to reflect. I’m somewhat at a loss to explain how it took me so long to catch on to the music of Overhead the Albatross or why Learning to Growl languished on my to-be-reviewed list. There is so much to love in the vibrant, energetic, life-affirming music of this instrumental rock collective, especially their incorporation of their rich Irish folk music heritage. Perhaps nothing conveys the power of the music and their apparent joy in playing it like this video of the rousing final track, “Big River Man”. Alturas may have been written over a three-year period across two continents and multiple coasts, but the effortless flow and tight integration that is the trademark of the band’s style betrays nothing of the patchwork nature of their origins. The thoughtful melodies, fluid bass lines, solid grooves, and pristine guitar work that fans know so well are have not gone anywhere – if anything, they have sound even more assured and have an extra shimmer & shine while an enhanced focus on piano, keyboards, & synth adds a welcome new dimension. The band’s second album is the antithesis of the sophomore slump and shows how much their creative vision and skills have grown. Once again the sound is an infectiously rhythmic hybrid of sophisticated jazz, primal rock, and elegant electronica with a keen focus on percussion. Juniper thunders, shakes, and shimmers, bursting with dazzling inventiveness, and the simple joy of playing. Indicating he has never been comfortable nurturing a long build-up to a new album, Scott Hansen decided to spring surprise release for ‘Epoch’ which comes right of the gate with infectious energy and a new dynamism that reflects the transition of Tycho from a solo project into the multi-faceted and very tight band that matured during the touring phase following 2014’s Awake. Organic, electric, and kinetic, it is an exhilarating ride. That said, I was particularly enamored of the calming flow of the final coda, “Field” which brings it all to a safe & gentle landing. After almost a decade of silence this their eponymous debut (the name is taken from an old Norse phrase meaning “enjoy eternal bliss”), yndi halda returns with four sprawling songs, each one like a river with the unseen impetus of a gentle current below the surface and pastoral ever-changing beauty above. The sound is an intoxicating amalgam of bucolic folk and drowsy vocals with modern classical swells and effusive and exhilarating crescendos which bloom rather than explode.